When it comes to cooking, there are a few essentials that I just cannot cook without. 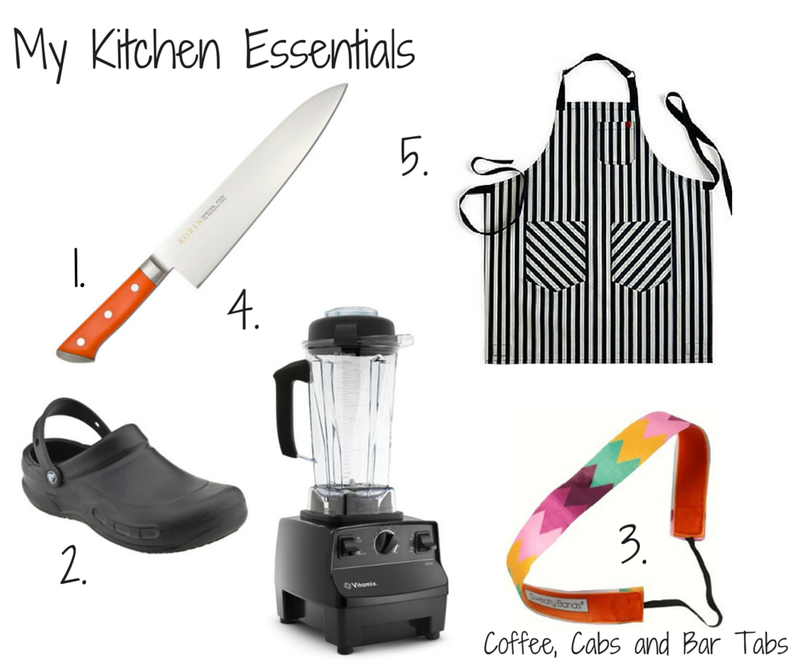 Below is a list of my kitchen essentials, guaranteed to make cooking easier and more fun! For a chef, your knife is one of the most important tools you’ll ever have. There are hundreds of styles, brands, shapes, and sizes; it can be challenging finding the perfect one. For me personally, I love a Japanese knife because of its lightness and blade quality. I especially fell in love with the Korin Special Inox Orange Handle 7 inch Chef’s Knife I received as a gift a few months back. This Japanese knife has a strong blade that’s great at holding its edge. It’s an all around reliable knife that can be used for a wide range of tasks. Whether you’re a professional chef or home cook, definitely invest in a knife, as it will quickly become one of your own kitchen essentials. Working in a kitchen means a lot of standing, and believe me, your dogs are gonna start barking! It’s important to purchase some supportive (and safe) shoes when cooking, for your safety and health. I wear Crocs Bistro Work Shoes in black. They are super light and amazingly comfortable. The best part is that they are entirely waterproof, so at the end of dinner service you can thrown them into the dishwasher and they’re good as new. Definitely get yourself some good kitchen shoes (your back will thank you). Since going to a traditional French culinary school, it has become a habit of mine to always have my hair pulled back in a pony tail with a headband. Believe me, when you’re trying to pull a hot pot of braising liquid out of the oven, the last thing you want to worry about is your hair falling in your face (or into the food). I have a lot of headbands, but one of my favorites are Sweaty Bands. It’s durable, slip resistant, and super cute to sport when you’re in your kitchen whites. For all my long-haired CC and BT followers, start your headband collection now! Once I got my first taste of a Vita-Mix food blender, there was no going back. They are extremely fast and powerful, and helpful in making a variety of sauces and purees. If you don’t already have a blender, go get one now! I would recommend the Vita-Mix 1002 Vita-Prep Food Blender (64 oz). This blender leans on the pricey side, but will last a lifetime and never fail in any task you present it with. Once you start using a blender, it will quickly become one of your essential kitchen tools. If you want to stay mess free, purchase an apron! There are so many styles and designs, you can really go wild. I love the professional aprons by Hedley & Bennett, especially their cute patterns and colors. This brand is also worn by some well known chefs like Richard Blaise and David Chang. An apron is always a kitchen essential, for the professional or home cook.